There are a lot of guides online on how to start mining bitcoins, and a lot of them require your pc running mining software and eating all resources or buying expensive dedicated hardware. This guide is for the option in between. A dedicated USB miner. It’s inexpensive and can get up to 2GH/s. I have bought an overclockable Bitmain Antminer U2 which can get up to 2.2GH/s if you overclock it. 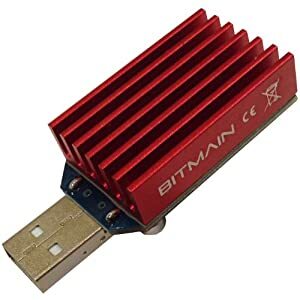 You won’t get rich with this usb miner by the way. In six hours I mined about 0,5 eurocent. But it is fun to explore and try out. I paid 25 dollar for the usb miner, which is about 18 euro. So it will take me about three years to it earn back. Not to mention power consumption. I have setup an account at bitcoin.cz this will give you an address like stratum+tcp://stratum.bitcoin.cz:3333 and the worker name and password. I have used this website to convert bitcoins to euro. Multibit is my windows wallet client. You can view recent bitcoin transactions on blockchain and convert them to your currency with the first link.